Ask random people here what “drinking the Kool-Aid” means, and they mostly just shrug. Cult leader Jim Jones, who in 1978 incited 900-plus followers to commit suicide by drinking the cyanide-laced beverage, may be the sole reference point many Americans have to this country. But that dark legacy — and the catchphrase it generated — barely resonates here. “I’d never heard of the guy until a year ago,” says Vito Edwards, 18, who is standing in the open-air dining area of his family’s Rock View Lodge. No doubt, tourism officials can’t wait for more Americans to share Vito’s oblivion. Though tourism is relatively new to Guyana, it is gaining momentum, particularly in the Rupununi region in the south. Here, a network of small-scale, low-impact eco-lodges, like Rock View, are gradually revamping the nation’s image from that of crazy-cult haven to that of unspoiled destination. How undiscovered is this place? •Guyana’s only north-south road, is mostly unpaved. The 320-mile bus ride from Georgetown, the capital, to the Brazilian border takes about 14 hours. 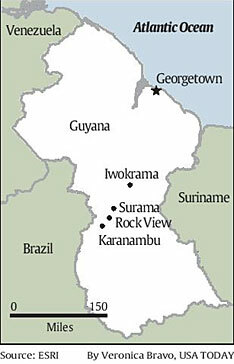 •More than 80% of Guyana is virgin rainforest. Viewed from the air, the land looks like an unending field of broccoli, broken only by occasional raw, red mining scars where gold and diamonds are being scratched from the earth. •Its forests and rivers are teeming with wildlife, including species that are extinct or threatened elsewhere. •It attracts a an estimated 2,500 purely leisure visitors annually. That’s about the number that descend on Peru’s Machu Picchu in a single day. The Rupununi landscape, which ranges from lush rainforest to sprawling savannah, is peppered with far-flung Amerindian villages. The terrain might not look all that different today than it did when Sir Walter Raleighpassed through in search of the mythical City of Gold in the 1580s. This spring, Swiss travelers Susanna Dellai and Claudine Werndli were lured here by their own dreams of discovery. Sitting in the Round House, a spacious pavilion at Iwokrama International Centre, they are lingering over a dinner of grilled fish pulled this morning from the Essequibo River. The Iwokrama complex is at the heart of a million-acre research project aimed at conserving and managing this densely forested region. Today’s wildlife sightings include otters, toucans, a caiman, several species of monkeys and a snake. After dark, they venture out on the river. Gliding through water the color of milky coffee, the guide steers the boat toward the shore and focuses a high-beam light into a treetop. There, a pink-lipped porcupine nibbles on leaves, unperturbed by the intrusion. In the morning, the friends are back out before dawn, eyes trained for tropical birds such as blue-and-yellow macaws. The croak of tree frogs, buzz of cicadas and drone of distant howler monkeys provide a rhythmic back beat to the soprano trills of assorted birds. In terms of Caribbean tourism development, “Belize is 20 years behind Costa Rica, and Guyana is 30 years behind Belize,” says Daniel LaPierre, Iwokrama’s tourism manager. It’s dusk and LaPierre is behind the Round House bar pouring rum and Coke for the few guests. (Hold the ice; it’s a scarce commodity in the jungle.) Bats are performing aerial acrobatics under the broad, thatched roof. Call it the pre-dinner show, Rupunini-style. The region’s lodges differ in focus and flavor, but travelers seeking deluxe digs and choreographed entertainment should look elsewhere. Iwokrama, for example, is foremost a research facility, but its eight guest cabins have comfortable beds and spacious porches in a remarkable setting. As in the other lodges, the food is basic, but delicious, partly because it’s so fresh. 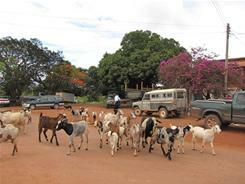 About three hours away (depending on road conditions) in the Rupununi savannah is Surama, an Amerindian village of 300. The community was the first of its kind to welcome tourists in the 1990s. (It now has four benabs, simple thatched huts that sleep up to four.) Guests are encouraged to visit the village, its primary school, and to interact with local artisans. Farther south, Karanambu Ranch is the domain of 80-year-old Diane McTurk, aka The Otter Lady. To date, the Guyanese native has returned 52 orphaned giant river otters to the wild. (“I don’t say rehabbed,” she stresses.) The ranch accommodates 12 guests, many of whom are hoping to join in the otter rescue. “Unfortunately, we’ve been so successful with the otter project we have no otters (in residence) now,” she says. Regardless, the nearby river is ideal for spotting the creatures. Rock View Lodge is as centrally located as it gets in the Rupununi — it abuts a commercial airstrip near the village of Annai. Proprietor Colin Edwards is a long-time British transplant who helped build the first road here in the early 1990s. With its palm-lined driveway, manicured grounds and swimming pool, the lodge leads the way in creature comforts. Fresh produce comes from its gardens, and he’s adding a stocked pond so guests can fish for their dinner. Guyana’s fledgling tourism industry has created jobs for indigenous people. But it also has changed the way some view their world. Still, Thorne adds, not every community needs an eco-tourism lodge and those that do have them intend to keep their visitor operations small. “They don’t want tourism to run their lives,” he says of most Amerindians in these parts. Gary Sway, 29, can relate to that. The Macushi tribe member notes that 600 visitors came to Surama last year, up from 40 when the operation began nearly two decades ago. The income has brought benefits — like a new primary school.